See the Calvert Journal's "Looking for Lenin" for a fascinating series of photos by Neils Ackermann documenting dismantled Lenin statues across Ukraine. In his dissertation, Dr. Richard Clay—art historian at the University of Birmingham and art TV show host—wrote in defense of the iconoclasts who brought down la Barriere de la Conference. They, he said, “used the sculptures at the gate as a resource for public protest and as a means of signifying the political positions of those involved” (PDF linked below). To this day, he examines the deeds of the sans culottes in a positive light on his TV programme. One cannot help but draw parallels between the recent ‘Lenin-O-Fall’ in Ukraine—a surge of activist demolitions targeting statues of Lenin. During the Soviet era, it was mandated that every town erect a statue of Lenin. With Ukraine’s annexation on the backdrop, the demolition of Lenins across the country functions is an anti-Soviet—and thus anti-Russian—outlet. Yet the merit of destroying France’s royalist symbols is under debate. Undoubtedly then, the same questions surround Lenin-O-Fall. 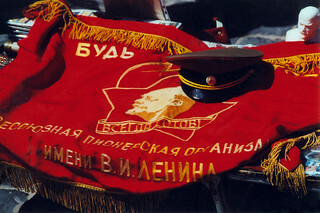 Justinian A. Jampol, founder and executive director of The Wende Museum and Archive of the Cold War in Culver City, California questions the advantages of Lenin-O-Fall. Writing for The New York Times, he argues that erasing memories of the Soviet regime will prevent the reflection necessary for a proper healing process. Tearing down Lenins, he contends, will not piece together a divided nation. Yet to proponents, the idea of conserving monuments that commemorate a figure blamed for political repression and deaths, seems to do the opposite. Rather than providing spaces for contemplation, it incurs a reliving of past traumas. Whatever the philosophy backing Lenin-O-Fall, the magnitude of the movement is so grand that an online database documenting each demolition has been created (linked below). Jastinian A. Jampol. “Smashing Lenin Won’t Save Ukraine.” The New York Times, March 3, 2015. Accessed March 4, 2015. http://www.nytimes.com/2014/03/04/opinion/smashing-lenin-wont-save-ukraine.html?_r=0. Patrick Mulkern. “The French Revolution: Tearing Up History.” RadioTimes. Accessed April 30, 2015. http://www.radiotimes.com/episode/cvyksb/the-french-revolution-tearing-up-history. “Ukraine Region Plans Mass Purge of Soviet Lenin Monuments.” The Moscow Times, October 15, 2015. Accessed November 25, 2014. http://www.themoscowtimes.com/news/article/ukraine-region-plans-mass-purge-of-soviet-lenin-monuments/509473.html. 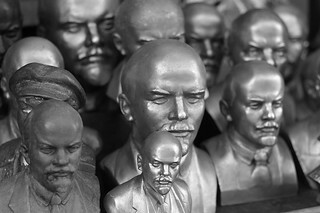 “Podcast: Goodbye, Lenin.” Radio Free Europe, April 24, 2015. Accessed April 30, 2015. http://www.rferl.org/content/podcast-goodbye-lenin/26976711.html. «Сколько всего памятников Ленину?» [How Many Monuments to Lenin Total?] Памятники Ленину [Monuments to Lenin]. Accessed November 2, 2014. Comments Off on Ukraine: Erasing Communism? Ukraine’s recent past has been anything but calm. Two fresh revolutions under its belt, a presidential ousting, and the Russian conflict in Crimea and the Donbas. The common thread among these events? Ukraine’s Soviet legacy, which the country is trying to eradicate, and prevent it from coming back for a round two. Recently, Ukraine took a legislative measure to fight against its Soviet past. While the passing of a bill may not be as gripping a maneuver against Russia compared to mass protests, the Verhovna Rada’s decision to ban communist and Nazi propaganda and symbols is a quantum step in (re)claiming history, national memory, and public space from the grip of Russian imperial master narratives. This was not the first of measures taken to reclaim public space. Activists across the country have been participating in ‘Lenin-O-Fall’—the demolition of Lenin statues. A debate on whether or not to remove Soviet military commander Nikolai Vatutin’s monument in Kyiv is now taking place, and the hammer and sickle have been replaced with the iconic Ukrainian Tryzub (Trident) on the gates of Ukraine’s parliamentary building. With Ukraine’s new law, any organizations (political, media, etc.) charged with the propagation of communism or Nazism will be shut down and investigated, with the results made available to the public. 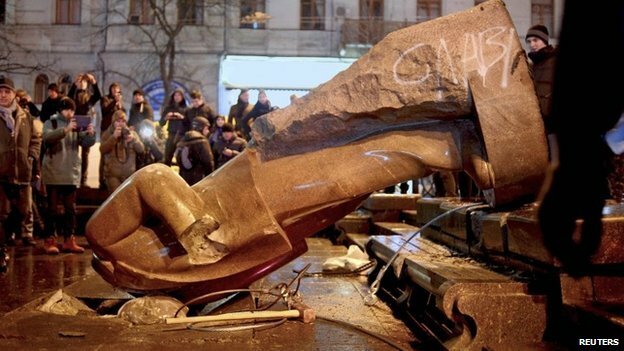 After the law was passed, Ukrainian activists in the city of Dnipropetrovsk brought down another statue of Lenin. Two days after the law was passed, a series of statues in Kharkiv were destroyed—including a sculpture of Russian hero Nikolay Rudnev, made by Soviet sculptor Viktor Volovik. In response to the ban on communist and Nazi propaganda, Russia’s foreign ministry stated that the law would lead to “rewriting history” and advance “nationalist ideology.” However, Alexander J. Motyl, professor of political science at Rutgers University, states that according to a study by the Moscow-based Institute of Demography, Ukraine “suffered close to 15 million ‘excess deaths’ between 1914 and 1948. Of that total, about 7.5 million were attributed to Soviet policies and 6.5 million to the Nazis,” concluding that de-Nazification and decommunization are both crucial; the latter allowing Ukraine to overcome its totalitarian past and move along a pro-Western trajectory. From this angle, the former Soviet republic is reclaiming its history, free of colonial dogmas of Soviet, Russian, and neo-Soviet ideologies. Irrespective of value judgments, Ukraine is indeed rewriting the narrative by reclaiming its public spaces. Alexander J. Motyl. “Kiev’s Purge: Behind the New Legislation to Decommunize Ukraine.” Foreign Affairs, April 28, 2015. Accessed May 1, 2015. https://www.foreignaffairs.com/articles/ukraine/2015-04-28/kievs-purge. Volodymyr Viatrovych. “’Decommunization’ and Academic Discussion.” Krytyka, May 2015. Accessed May 3, 2015. http://krytyka.com/en/solutions/opinions/decommunization-and-academic-discussion. “Ukraine Bans Communist and Nazi Regime Propaganda.” UT: Ukraine Today, April 10, 2015. Accessed April 12, 2015. http://uatoday.tv/geopolitics/ukraine-bans-communist-and-nazi-regime-propaganda-420628.html. Nolan Peterson. “Ukraine Purges Symbols of Its Communist Past.” Newsweek, April 10, 2015. Accessed April 12, 2015. http://www.newsweek.com/ukraine-purges-symbols-its-communist-past-321663. Lily Hyde. “Ukraine to Rewrite Soviet History with Controversial ‘Decommunization” Laws.” The Guardian, April 20, 2015. Accessed April 20, 2015. http://www.theguardian.com/world/2015/apr/20/ukraine-decommunisation-law-soviet. “Dispute Rages Over Soviet General’s Grave in Ukraine.” Big News Network, April 12, 2015. Accessed April 12, 2015. http://www.bignewsnetwork.com/index.php/sid/231877175. “Soviet Symbol on Verkhovna Rada’s Gates Replaced by the Coats of Arms of Ukraine.” UT: Ukraine Today, April 3, 2015. Accessed April 5, 2015. http://uatoday.tv/news/soviet-symbol-on-verkhovna-rada-s-gates-replaced-by-the-coat-of-arms-of-ukraine-419410.html. Henri Neuendorf. “Soviet Art Smashed in Ukraine After Controversial New Law Bans Nazi and Communist Symbols.” ArtnetNews, April 13, 2015. Accessed April 14, 2015. https://news.artnet.com/in-brief/ukraine-russia-soviet-artwork-287324. Last year, the Kyiv City State Administration and Ukraine’s Ministry of Culture kicked off a competition asking Ukrainians to design a memorial commemorating the Heavenly Hundred Heroes—those who died at the Maidan Nezalezhnosti. Today, the competition for the project, “Terra Dignitas: Reinventing Public Space in Kyiv’s City Core and Commemorating the Revolution of Dignity,” is soliciting proposals for the entire surrounding space, worldwide. Competition on the best project/design of the “Museum of Maidan” ignited a robust discussion in social networks. There are 24 submissions in this category, with 148 project proposals all in all—with ideas ranging from an “angel with a cross to light art installation”—competing in 4 categories. 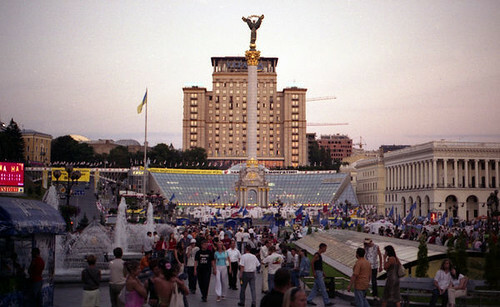 The remaining categories concern the design of the space of Maidan and Kyiv`s city core (with 29 competing projects), the commemoration the Revolution of Dignity and memory of the Heavenly Hundred Heroes (boasting a whopping 86 proposed projects), and the International cultural center "Ukrainian House on European Square" (9 projects). Public discussion and polling will continue until the beginning of May, and then the results will be given to a professional jury. In recent discussions, it has been agreed that the renovation of the Maidan into a beautiful and inviting public space—including benches, fountains, and playgrounds—should take priority over museums and monuments. University Lecturer Vladyslava Osmak suggests that the area ought to be a place of celebration and healing rather than a place of mourning. Міжнародний відкритий конкурс «Територія гідності»/International Open competition “Terra Dignitas.” Accessed December 15, 2014. http://terradignitas.kga.gov.ua/en/. Rory Stott. “City of Kyiv Launches ‘Terra Dignitas’ Revolution Memorial Competition.” ArchDaily, November 1, 2014. Accessed November 15, 2014. http://terradignitas.kga.gov.ua/en/. Claire Rosemberg and Olga Shylenko. “Museum or Memory Lane? Kiev Mulls Memorial to Maidan Victims.” Yahoo News, April 17, 2015. Accessed April 18, 2015. http://news.yahoo.com/museum-memory-lane-kiev-mulls-memorial-maidan-victims-191145241.html. «До створення пам'ятного меморіалу Героям Небесної Сотні приєднаються міжнародні митці.» дивись.inf, November 14, 2014. Accessed December 5, 2014. http://dyvys.info/kultura/do-stvorennya-pam-yatnoho-memorialu-heroyam-nebesnoji-sotni-pryjednayutsya-mizhnarodni-myttsi-foto.html. «Від янгола з хрестом до світової інсталяції: яким стане Майдан.» MEDIEMIX. TV 24, April 7, 2015. Accessed April 25, 2015. http://www.mediemix.com.ua/detail/196996-Від-янгола-з-хрестом-до-світової-інсталяції-яким-стане-Майдан. The destruction and alteration of monuments - particularly to Lenin - that began on the Maidan in Kyiv continues to spread to other Ukrainian cities. Here is an angry Russia Today article about a monument to Soviet Field Marshall Kutuzov being pulled down in the Western Ukrainian town of Brody. Even more interesting, though, is an interactive, regularly updated map showing cities and dates in Ukraine where Lenin statues fell, squares were renamed, etc., called Good Bye Lenin - The Desovietization of Ukraine. Here is a link to the full-length YouTube video of the statue being destroyed - amazing! Maria's comments on the photo below: "This is the pedestal of what used to be Lenin's monument in Kyiv. The Russian-language stickers are probably targeted at those who come to mourn, rather than celebrate Lenin's toppling. One says: "it [maidan] is not for Europe-- it's against corruption. Come to Maidan"
Oxana Shevel posted the photo below, with a translation of the joke: "Dear Nadia (Lenin's wife's name), I left to support the revolution. Your Vladimir"
KIEV, Ukraine — Public protests thundered into a full-throttle civil uprising in Ukraine on Sunday, as hundreds of thousands of protesters answered President Viktor F. Yanukovich’s dismissiveness with their biggest rally so far, demanding that he and his government resign. At the height of the unrest on Sunday night, a seething crowd toppled and smashed a statue of Lenin, the most prominent monument to the Communist leader in Kiev. The act was heavy with symbolism, underscoring the protesters’ rage at Russia over its role in the events that first prompted the protests: Mr. Yanukovich’s abrupt refusal to sign sweeping political and free-trade agreements with the European Union. . . . Later, as the Lenin statue was pulled down and men took turns splintering it to bits with a sledgehammer, protesters twice sang the national anthem, removing their caps and covering their hearts with their hands. One of the hammerers wore his hair in a mohawk; another was a priest in black vestments. Onlookers shielded their faces from the flying granite chips as they cheered them on, yelling: “Good job, guys.” A spokesman for Prime Minister Mykola Azarov called the statue’s destruction “barbaric.” . . . In the largest demonstrations since the country's Orange Revolution, protesters tore down the symbol of Soviet influence. There are many ways to create iconic moments during protest movements, but perhaps none is as reliable—as fraught with symbolism—as toppling a statue. On Sunday, as hundreds of thousands of Ukrainians took to the streets of Kiev in the largest anti-government demonstrations since the country's 2004 Orange Revolution, protesters did just that—tearing down an 11-foot-high statue of Bolshevik leader Vladimir Lenin with a steel wire, smashing the monument with sledgehammers, and then carrying off prized pieces of the sculpture. The massive "Euromaidan" protests, which have been roiling Ukraine since President Viktor Yanukovych rejected an EU trade deal in late November in an apparent effort to move the country away from Europe and toward Russia, are led in part by the right-wing, nationalist Svoboda party, which gleefully reported its involvement in the toppling of the Lenin statue (predictably, members of the country's Communist Party are fuming about the incident). The statue, it turns out, has a remarkable history—and not just as a locus of protest during the latest wave of demonstrations in Ukraine. The monument was first created by the Soviet sculptor Sergey Merkurov, a man famous for making a plaster "death mask" of Lenin on the night he passed away, for a Soviet exhibition at New York City's World's Fair in 1939 (see the postcard on left). And it was hastily imported to the Ukrainian capital in 1946 when, as one BBC account puts it, local authorities suddenly realized "that unlike all the other Soviet republic's capitals, Kiev had mysteriously remained Lenin-free." . . . .
KIEV, December 30 (RIA Novosti) ­ A statue to Russian revolutionary leader Vladimir Lenin was toppled in the central Ukrainian town of Vatutino on Sunday night only to be put back in place several hours later, the UNIAN news agency reported Monday. "A group of unidentified persons detached the monument from the pedestal and toppled it. But it turned out that the statue, made of plaster and bricks, was solid enough to sustain the fall. Only the back of Lenin's head and his cheek were slightly damaged," the agency said. Municipal workers put the statue back in its place on Monday morning and fixed it there with a layer of concrete. A number of Lenin statues across the country have been vandalized since early December amid ongoing protests against the government's decision to halt a landmark political and free-trade deal with the European Union and, instead, opt for stronger ties with Russia. The first and most notable act of vandalism took place in the capital, Kiev, on December 8, when a landmark statue of the founder of the Soviet Union was torn down by pro-European protesters in symbolic defiance of Russian influence. 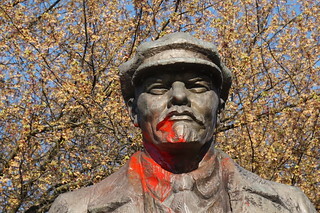 Hours later, another statue of the Soviet leader was vandalized in the southern town of Kotovsk. As protesters gathered in the Ukrainian capital Kiev in late November, the authorities in Vietnam probably gave little thought to a story unfolding thousands of miles away. The blockade by protesters angry at a government U-turn on a free trade deal with the EU was widely covered in the Vietnamese press and proved a popular subject on social media. But everything changed in Vietnam when the statue of Vladimir Lenin came crashing down in Kiev. On Sunday a group of protesters smashed and dismembered the city's statue of the Russian revolutionary leader. Transgression too far?As was to be expected, the news was quickly and widely reported on all major websites in Vietnam. On the BBC Vietnamese website, it went straight to the most read spot, proving even more popular than coverage of the death of Mandela and protests in Thailand. But within 24 hours, all that changed in Vietnam - there was soon no trace to be found of articles mentioning the toppling of Lenin. State media coverage of Ukraine's continuing unrest was subdued. The most plausible explanation - say many analysts - is that the toppling of the statue of the revolutionary struck a nerve in Vietnam's Communist government. Where previously authorities saw little harm in fairly neutral coverage of a country so far away, the fate of the carved and polished red Labrodorite Lenin was a transgression too far and they suddenly developed cold feet. The Soviet leader is still revered by the ruling Communist Party in Vietnam, where his birthday is still celebrated each year. It may well have been an unwelcome reminder of countless statues of Lenin and other Soviet leaders being brought down as the former Soviet Union collapsed. Vietnam has its own notable statue. A 5.2m-high (18ft) bronze figure of Vladimir Ilyich Lenin on a 2.7m marble pedestal peers down at passers-by in central Hanoi. The statue was given to Vietnam by the Soviet Union in 1982. It overlooks some of Hanoi's most important sights. Lenin has become very much part of the landscape and few of those strolling through the park he is placed in would give him much thought. 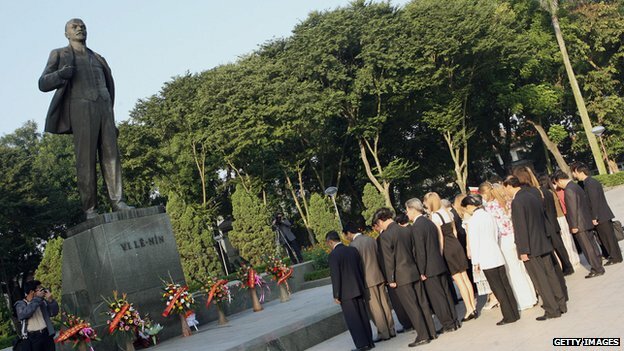 The official Vietnam News Agency described those who knocked down the statue as "extremists". Meanwhile, Thanh Nien, a major newspaper in Ho Chi Minh City, said "hundreds of thousands of anti-government protesters" toppled the statue of the founder of the Soviet Union. Its tone of disapproval was similar. Then the state media machine kicked in. After all, statues of Vietnam's own communist revolutionary leader Ho Chi Minh are also to be found in cities around the country. There was cyber silence in Vietnam as articles were pulled from the websites. On Google, when one clicked on the headlines, one would be notified of "errors" - although many articles could still be found via Google Cache. The BBC was told that editors at some newspapers received "instruction on telephones" from the Ideological Department of the Communist Party, which enforces media censorship and control in Vietnam. But once news came out that the story had been censored, Vietnamese on social media started to become aware of just how sensitive the party was to that particular story. It is actually when the stories disappeared that people began to notice. "Politicians and leaders should learn to face the truth. You cannot hide everything any more," one user wrote on the BBC Vietnamese Facebook page. Indeed, had the authorities not become so fearful of news in Ukraine fuelling dissent in Vietnam, readers may well have glanced over the images of a fallen giant without giving a second thought to the bronze figure standing in Hanoi's Lenin Park. The BBC also invites you to enjoy Five Lenin Statues in Unexpected Places. Here's another update, an article from the BBC entitled Ukraine Commits Statuecide.